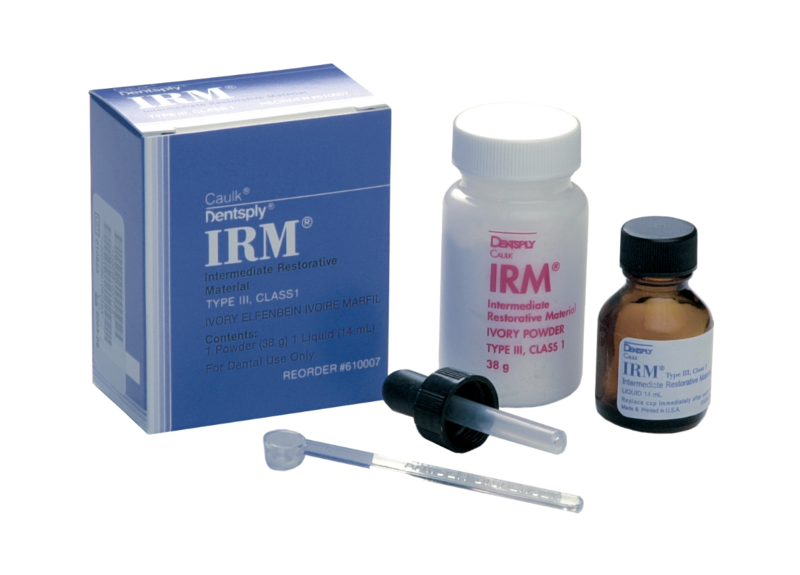 IRM Intermediate Restorative material is designed for intermediate restorations intended to remain in place for up to one year. The eugenol content in the polymer-reinforced zinc oxide-eugenol composition gives the material sedative like qualities on hypersensitive tooth pulp and is a good thermal insulator as well. IRM may also be used as a base under cements and restorative materials that do not contain resin components, such as amalgams, and inlays and onlays. Among the many other applications are: emergency placement prior to complete treatment, endo access openings, pedo teeth that will soon exfoliate, and caries management programs. Its strength properties approach those of zinc phosphate cement. Other physical-related clinical advantages include: excellent abrasion resistance good sealing properties and low solubility. This material is available in an ivory shade via capsule or a powder liquid hand-mix delivery.